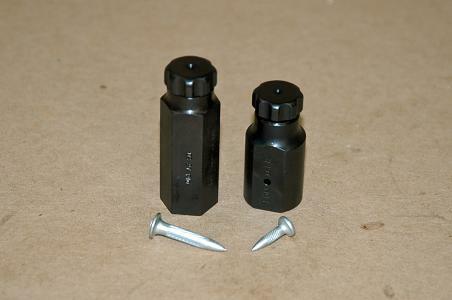 Hilti nails for small glass breaker,..
Hilti nails for large glass breaker,..
Large on the left, Small on the right. 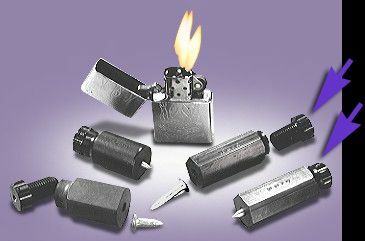 Both poppers use a D60-3 or T12-3 squib to operate. The Large Glass Breaker or Popper is used for breaking tempered glass. The body of the breaker is turned from 3/4 inch (19mm) cold rolled steel hex bar stock and uses a large Hilti nail to notch and break tempered glass. On critical shots, such as a stunt person hurling themselves through a aheet of tempered glass, we always use two poppers.